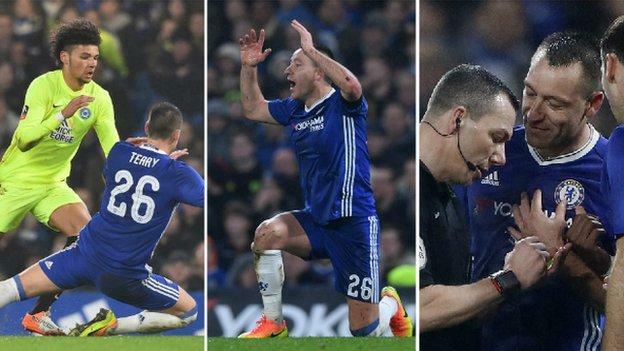 Chelsea captain John Terry was sent off on his first start since October as the Premier League leaders overcame League One Peterborough in the FA Cup. The Blues made nine changes for the third-round tie and almost trailed when Asmir Begovic saved Lee Angol's close-range header. Terry saw red for bringing Angol down as the last man and Tom Nicholls prodded in from six yards for a buoyed Posh, only for Pedro to restore a three-goal advantage from the edge of the box. Before his early bath Terry had completed 100% of his 30 passes, though he only won 20% of his duels, less than defensive partners Gary Cahill (50%) and the fit-again Kurt Zouma (60%). "John played a really good game," added Conte. "For me, in this season he has shown me great ability."